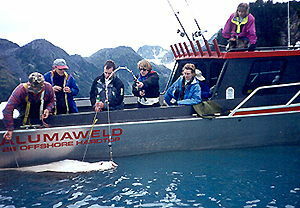 Fish the halibut grounds out of Cook Inlet in our 28-foot Alumaweld boats or our 30-foot ACB boat. The ride in the boat on the Cook Inlet waters to the halibut fishing grounds is approximately 45 minutes to 1 hour, so sit back and enjoy the ride–there’s bound to be a “fishing” story or two being told on this trip. Once the boat is stopped and the anchor is set, the charter captain and deckhand will assist each person with the fishing pole by baiting each hook and placing an appropriate size weight on the line (all dependent upon the tide that day). The charter captain and deckhand will let you know what it should feel like when you have a fish on your line, and what to do before and after catching a fish.